[139 Pages Report] Wastewater Treatment Services Market size was valued at USD 71.50 Billion in 2016 and is projected to reach USD 97.18 Billion by 2022, at a CAGR of 5.3% from 2017 to 2022. The base year considered for the study is 2016, while the forecast period is from 2017 to 2022. Both, top-down and bottom-up approaches were used to estimate and validate the size of the wastewater treatment services market, and to determine the sizes of various other dependent submarkets. The research study involved extensive use of secondary sources, directories, and databases, such as D&B Hoovers, Bloomberg, Chemical Weekly, Factiva, and other government and private websites to identify and collect information useful for a technical, market-oriented, and commercial study of the wastewater treatment services market. 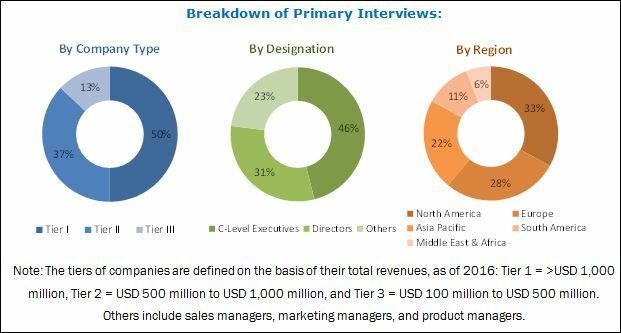 Key players operating in the wastewater treatment services market include Veolia Water Technologies (France), SUEZ (France), Xylem (US), Evoqua Water Technologies (US), Thermax (India), Ecolab (India), and W.O.G. Group (US). This research report categorizes the wastewater treatment services market on the basis of type, end user, and region. The wastewater treatment services market is projected to grow from USD 75.22 Billion in 2017 to USD 97.18 Billion by 2022, at a CAGR of 5.3% during the forecast period. Wastewater treatment encompasses various mechanisms and processes involved in the treatment of wastewater generated from various industries. Water is the basic necessity for both households and industries. Wastewater generated from residences and industries is not fit for consumption or disposal, as it contains harmful impurities. Thus, the treatment of wastewater is essential to prevent the contamination of waterways. Wastewater is treated in 3 stages, namely, primary, secondary, and tertiary. Moreover, wastewater treatment service providers play a vital role in wastewater recycling and safe disposal of industrial wastewater. Based on type, the wastewater treatment services market can be segmented into design & engineering consulting, building & installation, operation & process control, and maintenance & repair. The operation & process control segment is projected to be the largest type segment of the wastewater treatment services market. Based on end user, the wastewater treatment services market has been segmented into municipal and industrial. The industrial segment of this market has been further classified into chemical & pharmaceutical, oil & gas, power generation, metal & mining, food, pulp & paper, and others. An increase in industrial output is further boosting the demand for industrial wastewater treatment services. Wastewater treatment services are used to manage various wastewater treatment operations that range from design to maintenance of wastewater treatment plants. 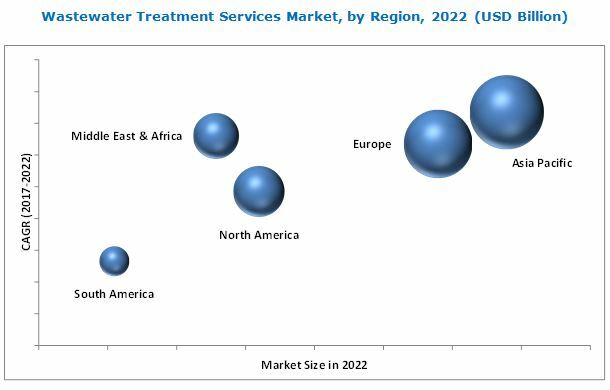 Increasing population, expanding manufacturing sector, and rising regulatory requirements are key factors projected to drive the growth of the wastewater treatment services market. Initiatives undertaken by manufacturing industries to lower waste generation and awareness regarding new water treatment technologies are additional factors boosting the growth of the wastewater treatment services market. Asia Pacific accounted for the largest share of the wastewater treatment services market in 2016. This large share can be attributed to the increased demand for industrial wastewater treatment services in emerging countries, such as India, China, Indonesia, and Thailand. The high cost of wastewater treatment technologies is acting as a restraint to the growth of the wastewater treatment services market. Key companies profiled in the wastewater treatment services market include Veolia Water Technologies (France), SUEZ (France), Xylem (US), Evoqua Water Technologies (US), Thermax (India), Ecolab (India), and W.O.G. Group (US). Companies have adopted strategies such as partnerships & collaborations, expansions, and mergers & acquisitions to enhance their market shares and to widen their distribution networks. These companies are also engaged in research & development activities to develop new services, thereby strengthening their foothold in the wastewater treatment services market. For instance, Troy Corporation introduced Mergal GLT25 & GLT50 wet-state preservatives that provide protection against bacteria and fungi in aqueous systems. Mergal has a broad range of applications in industrial and metalworking fluids. Similarly, Veolia Water Technologies established the world’s largest sludge treatment and retrieval plant in Hong Kong. The company plans to treat wastewater from 11 different water sources in this city. This expansion strategy helped the company strengthen its footprint in the wastewater treatment services market.